We are currently progressing detailed architectural fit-out drawings for this luxurious bathroom conversion in Ilkley, West Yorkshire. 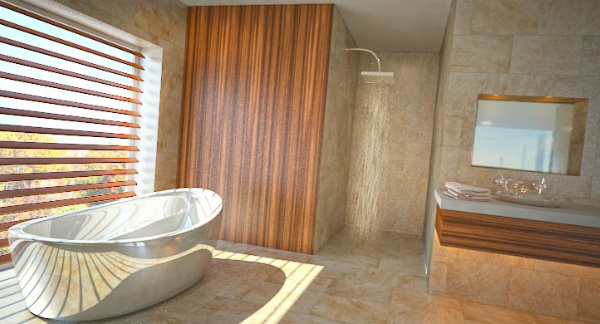 The existing 1970′s bathroom will be extended into a rarely used bedroom to create a huge new bathroom space. The floors and walls will be completely tiled in natural stone, with sections of timber cladding, a long stone topped vanity unit with a recessed sink, taps, and an illuminated recessed mirror detail. Hidden lighting below the vanity unit will create a subtle and attractive glow at low level, with the addition of adjustable spot-lighting at ceiling level in order to allow the client to set the perfect ambience for the room, which will no doubt serve as a delightful retreat. A large fully-tiled walk-in shower area will feature, along with an elliptical shaped free-standing bath which will be located in front of a large picture window, fitted with one-way glass, and enjoying the spectacular views up to Ilkley Moor.